My name is Jack Chen, I am 11 years old and, I have been shooting archery for a year now. I shoot an Absolute 38 with R-Strings & Cables (which have proven to be very durable), Hamskea rest, Axcel sight, Shrewd lens, Shrewd stabilizers, Victory 23’s, and a T.R.U Ball Pro Blade Release. In a year I’ve gone to many tournaments, and the ones I enjoy the most are the field shoots. One of my many accomplishments is a 300 58x, and without Rick’s coaching and guidance I would not be where I am today. I am 9 years old and starting shooting archery when I was 7. I thought it looked fun and gave it a try. When I was 8, I decided that this was the sport for me! I love working on and perfecting my technique. I really enjoy being with my friends at the club, and making new friends at tournaments. Currently I shoot a Hoyt Ruckus bow with Shrewd stabilizers and a TruBall Max 4 release. I started competing in the spring of 2017 and have participated in many tournaments in MN and the Midwest region. So far, I have placed at the MSAA State Field 2017 shoot, the NFAA 2017 National Outdoor Target shoot, and the 2018 Iowa Pro Am. This would not have been possible for me if it was not for the coaching and dedicated support from Rick. Rick’s patience and expertise has been priceless to my form, technique, self-confidence and equipment. When it’s time for me to upgrade or change to different style equipment, Rick and R-Strings and Cables have the expertise to tell me what will work best. I am excited to continue participating in the major archery tournaments, and honored to be a part of the R-Strings and Cables Junior Shooter Staff. I look forward to the exciting journey ahead! ​Hello! I am 12 years old and have been shooting since I was 9. I just started shooting tournaments around the Midwest in 2017 and have met a lot of new friends because of my interest in archery. I have had many mentors along the way, but Rick has brought me to my present shooting level. Without Ricks coaching and patience, I would not be where I am. We started our journey by meeting up with Rick and having a set of R-strings and Cables installed on my bow. From then on, we started some training sessions and working on form. My latest challenge has been to learn how to use a back-tension release. Rick has been there coaching me all along when I have issues. I am currently shooting an Elite Spirit bow with a QAD rest, BeeStinger stabilizers, and a HHA sight. So far, I have not taken less than a 3rd place in any tournament I have entered. 2017 I was really excited to win the MAA Voyageur Cup in Rogers. MN. This year so far I have placed 2nd at the IOWA PRO AM and hope to continue winning with the patience and understanding of Rick Rugroden and R-Strings and Cables. Thank You for the opportunity to be part of your junior shooting Staff. ​I started shooting archery three years ago when I was given a bow for Christmas by my grandparents. With a lot of hard work, coaching and encouragement from Rick I have come to love the sport. I started competing in April of 2016 and haven’t skipped a beat since. I am addicted to archery! I enjoy field archery the most and also set a new MAA state record last year in field, hunter and animal. I am shooting R-strings and Cables and have been extremely happy with them. I will continue to support Rick and his company because he has always been so supportive of me. I couldn’t have asked for anyone better than Rick to teach me (and my parents) everything we need to know about archery. He is always ready, available and willing to help in any way possible. Without Rick’s support and guidance I wouldn’t be the shooter I am today. I have been shooting for 4 years and I am a target staff shooter for R Strings & Cables and Bullseye Archery. With the help of Mark Franklin, Jack Moulton and Rick Rugroden I have improved so much since starting archery. I have shot R-Strings from the beginning and will continue to use them. Equipment: OK Absolute, Sure Loc, Alpha Omega stabilizers, OK blade rest. I have been shooting bows and bowhunting since 1988, taking my first animal, a whitetail doe, the following year. I've been hooked on archery and bowhunting ever since. Thanks to a very understanding spouse, I have hunted whitetail deer, mule deer, Rocky Mountain elk, Quebec-Labrador caribou, black bears and 2 species of turkeys. I was very lucky to take a large male coyote while deer hunting in Iowa a couple years ago. I have bow hunted in 6 states and Canada. In the off season, I enjoy target & 3-D archery, running, bowfishing and preparing for the next hunting season! My wife, Julie also enjoys shooting target and bowfishing with me. I have shot R-Strings since the inception of the company, and never, ever had any issues with my strings and cables. The help and support I have received from Rick is immeasurable. No matter what bow I am shooting on the range or in the woods, R-Strings are on it! I started shooting archery when I was five years old with the helpful guidance from Rick. Since then, I have placed in various tournaments such as the Iowa Pro Am, World Archery Festival, and the Minnesota State Archery Association Tournament. I also shot for the University of Wisconsin Stevens Point where I placed 7th in the outdoor national tournament and received All Academic and All American honors. When I’m not shooting at a target face, I like to bow hunt deer, bears, and turkeys while finding time to fish as well. I am currently using a Hoyt Pro Edge Elite for targets, and a Hoyt Carbon Spyder for hunting. Rick makes a high quality product and is very knowledgeable with a wide range of equipment. I have had R Strings and Cables on all my bows in the past and will continue to use them in the future. Started recurve target archery in 2007 on a beginners course. Did OK but got a bit fed up. Bought a Hoyt Rampage XT compound in 2012 and never looked back. Back then I was the only person in my club shooting compound. I taught myself to shoot from scratch as nobody there knew anything about compound. I taught myself to tune it and began to see some good scores. I eventually won some local competitions. Bought an OK Absolute 38 in 2014 and currently own 2 Absolute 40's. One for indoors and one for outdoors. Started having string problems with my factory OK Archery strings. Did some research and came across R strings and Cables. The reviews sounded good so I bought a set and fitted them to my bow. The serving separation issue I had has never come back. I can honestly say that they are superior quality to to factory ones. 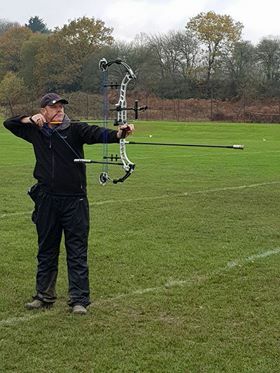 Currently ranked 4th in my county (HAMPSHIRE) Current WA1440 personal best is 1367 individual metric PB's 90M 334 70M 350 50M 346 30M 360 Classified as Master Bowman in 2018. This classification puts me in the top 3% of all compound Senior Gents in the country. ​My name is William "Bill" VanVorst, I have began shooting archery in 2009 while living in North Carolina. I had started off shooting 3D tournaments, and have been hooked on archery ever since. In 2010, I met Rick, after moving to Minnesota when a set of factory strings failed mid-shoot. I have been shooting the strings made by R-Stings & Cables ever since on every bow I've owned. I would travel around to shoots locally whenever I could, shooting as many shoots as I could before we ended up moving back to North Carolina. Moving back in late 2014, I joined the DC Archery Club and started to learn about spot shooting. My first big spot tournament was the 2016 Iowa Pro AM. A few short months later I placed 1st in my flight for my first ever MSAA state shoot. During that summer I started shooting the outdoor NFAA archery tournaments, the MAA state tournament, and other local shoots. OK Archery DST40 with R-Strings & Cables set up. I have been shooting Archery since 1985. I have shot many different bows and many different tournaments. I've had the pleasure to shoot with many great people and made a lot of lasting friendships over the years. My current setup is a Hoyt Podium 37, Acel sight and scope, Truball release, Fuse blade stabilizer and Easton arrows. I have been shooting R-Strings and Cables for a year now. Through the rain, wind and heat these strings preformed awesome. It has been my best year in archery yet. Can't wait for this next year to get started. I am a target staff shooter for R-Strings & Cables and Bullseye Archery. I have been shooting for 15 years and have used R-Strings since the beginning and will continue to use them. I have been a staff shooter with a variety of shops and used many different bows but have stayed true to R-Strings through it all. I shoot 3D, target, indoor spot, and hunt. I have trained with Rick from the beginning and it has helped me out to become better at a sport I love. Equipment: OK Smoke, Vapor Trail Blade X rest, Sure Loc, and Alpha Omega stabilizers. 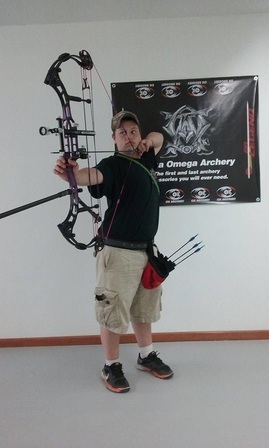 My name is Ryan Schrempp and I am a Target Staff Shooter for R-Strings and Cables. I started shooting Target Archery in 2016. I was fortunate enough to place first in my flight at my very first MSAA State Indoor Tournament in 2017. I shoot Indoor, 3-D, Field, outdoor target as well as bowhunt. My favorite bowhunting memory was shooting my first wild hog on a trip down to Texas. I feel extremely lucky to have met Rick as he has taught me just about everything I know in the world of archery. I have shot R-Strings and Cables on my target and hunting bows for a couple years now. I have tried out a few different string companies and I can honestly say that R-Strings and Cables are the most durable, consistent, and longest lasting strings I have ever shot. If you are looking for a truly top quality string & cable set that is handmade with meticulous attention to detail, you need to get a set of R-Strings and Cables! Hello, my name is Mike Ryan. I've been shooting since the time we made our own bows with a branch and a twine string. I started hunting in 1969, with a 55lb Ben Pearson and wood arrows. The degree of accuracy was not something we'd brag about. In 1973 I shot my first league, there were no compounds in the league. From that point I was addicted to the whole archery world, competition, family friendly social environment, and all the equipment advancements. I am proud to be a member of the archery family. 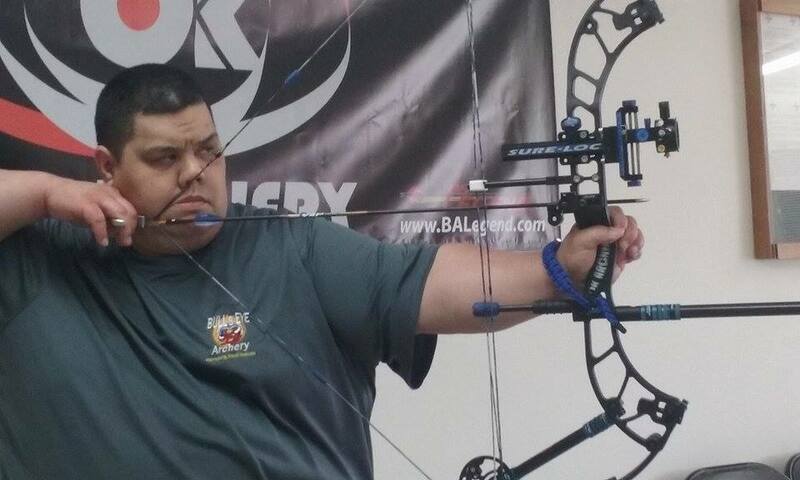 Archery has given me many opportunities, such as shooting the NFAA National Indoor tournament, many MSAA and MAA tournaments in different locations, and last year the Vegas shoot. I am happy to be on the R-Strings Staff. I have known Rick for a long time and respect his knowledge and experience in all things archery. I also respect his contributions to the Youth programs and his tireless effort to insure the success of their club. I can see his personality, and quest for perfection in every string he makes.